Can the NZ Yoga Industry Form a Cohesive Collective Body? Explorations into interoception and embodied anatomy with Donna Farhi. On a rainy Saturday morning in Auckland, I found myself in a packed auditorium, with around 85 yoga teachers and students, and several hundred fitness professionals, listening to renowned international yoga teacher Donna Farhi give a keynote presentation on interoception and kinesthesia. As Donna lead us through ten slow diaphragmatic breaths, the whole audience dropped into deep, yet focused, stillness. There were so many magical moments like this at the Hauora Yoga Conference: Moments of a profound collective experience, sometimes of quiet and stillness, and at other times of laughter, sadness or gratitude. I’d been nervous when I arrived, not knowing what to expect from New Zealand’s first ever Yoga Conference. How many people would be there? Would I know many of them? What would it feel like? As a yoga student, would I feel welcome at a conference created to deliver yoga content for professional development? As soon as I arrived at the onsite accommodation and settled into a conversation with my fellow conference-goers and roommates I knew I was in the right place. My three days at Hauora were easeful, flowing and full of fun. Yes, the days were very full and yes, there were the usual logistical niggles that come with a first-time event. And yet, the overall energy of the event was so positive and supportive that everything felt just right. J. Brown leading his signature workshop, Gentle is the New Advanced. 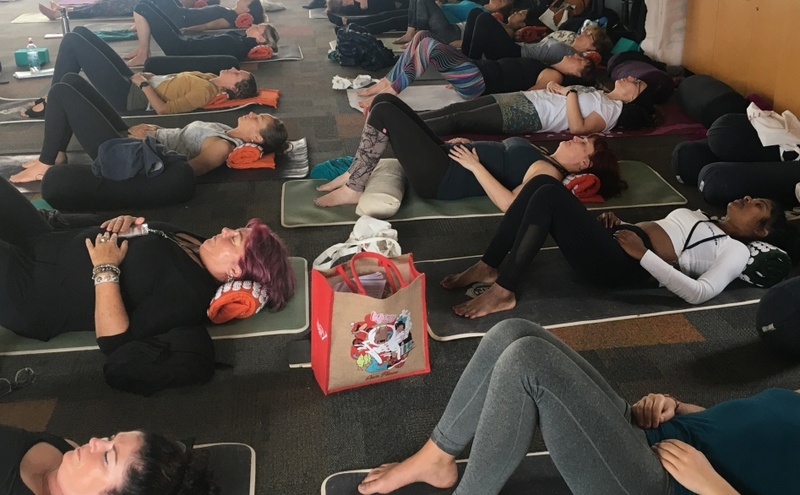 The Hauora Yoga Conference grew out of conversations between Richard Beddie, CEO of the Exercise Association of New Zealand, and Persephone Singfield, a Christchurch yoga teacher and founder of Courage My Love. After presenting at the annual Fitex Conference in 2015 Persephone wondered why the support that she saw offered to the fitness industry – which includes political advocacy, resources and tools around employment law, membership agreements, and health and safety standards, as well as the opportunity to come together annually for learning and discussion at a conference – wasn’t available to the yoga industry too. So they made it happen. 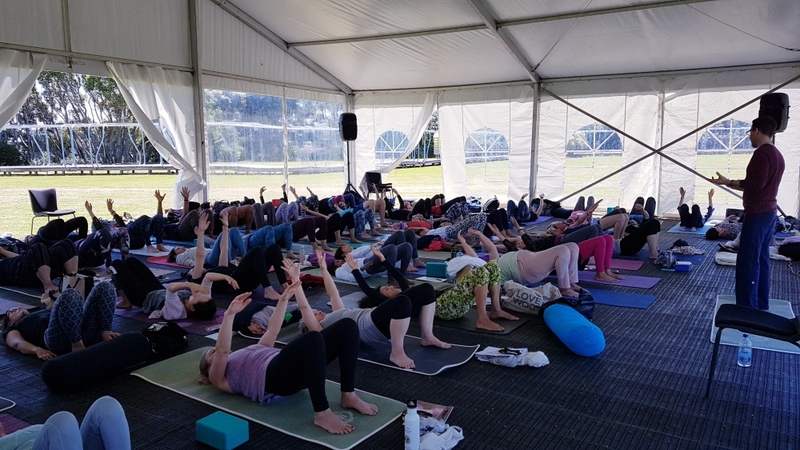 With Persephone on board, Exercise NZ put down the groundwork to both launch HYC (co-timed with the Fitex conference) and to reinvigorate Yoga New Zealand, formerly a branch of Yoga Australia, and support it under the Exercise NZ umbrella. So there I was, listening to Donna Farhi, one of my all-time favourite yoga heroines. I was surprised to learn that in addition to Donna’s many years of teaching, her journey into anatomy and interoception has been literally “close to the bone,” after she sustained two breaks to her pelvis last year. During her keynote, the x-ray of her broken pelvis caused a sharp collective intake of breath, followed by a lot of wincing. Ouch. That was a not a happy pelvis, let alone a functional one. And yet, a year later, the women in front of us was standing tall and strong. You couldn’t tell. It was a moving testament to the healing capabilities of the body when aided by a commitment to interception and a deep understanding of anatomy and movement. Another standout moment of collective magic was Jase Te Patu’s presentation on yoga and mindfulness from a Maori perspective. Jase’s passionate, open presence grounded the conference into the context of Aotearoa New Zealand right from the very beginning. In his evening presentation, he had us all laughing, crying, connecting with each other, and thinking deeply about what Hauora and wellbeing really mean. 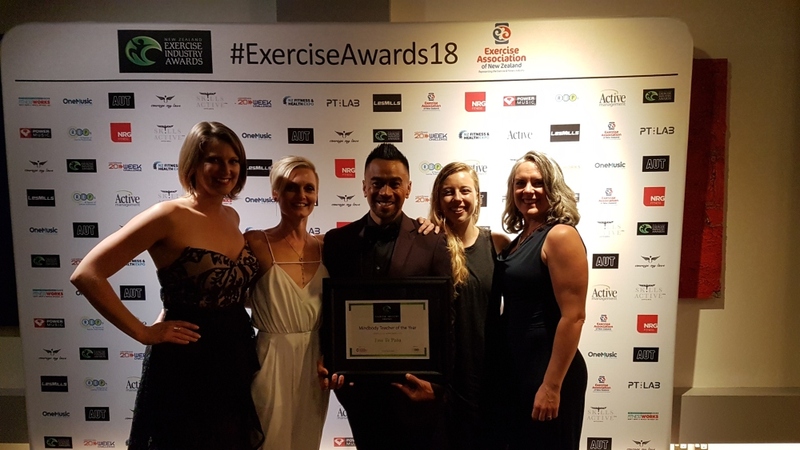 I was also lucky to be present when Jase won ‘Mind Body Instructor of the Year 2018’ at the NZ Exercise Industry awards on Saturday night. With people like Jase on board, I’m tremendously excited about where the NZ Yoga community is headed. The workshops (and there were many, from a wide range of local and international teachers), were all packed full of juicy, embodied goodness. Some favourite moments for me were ‘joy bubbles’ in Kylie Rook’s fascial flow workshop on vagal tone, discussions about yoga and emotional health with Katie Lane, an embodied exploration of the deep front line with Chaitanya Deva, and a gentle and playful exploration of the Shakti Mat with Keishana Coursey. I missed out on J. Brown‘s signature workshop, Gentle is the New Advanced, but I loved how strongly that sentiment showed up in the words and actions of many of the Hauora presenters and attendees. Getting up close and personal with the Shakti Mat in Keishana Coursey’s Sunday morning workshop. And then there were the people of the NZ Yoga community, many of whom I was meeting for the first time. As someone who works in the yoga industry in an almost 100% online capacity, it was an immense delight to be surrounded by the real-life, in-the-flesh yoga community. For once, my emails took a back seat to real-life conversations and interactions with yoga teachers, students and business owners from all over the country. I didn’t check my inbox once. Wonderful as they are, events like the Hauora Yoga Conference don’t happen by magic. So I’m profoundly grateful for the time, effort, love and sheer hard work that the many organisers, volunteers and presenters put into making it happen. I’m grateful too for the people like me who turned up, not knowing what would happen or what it would feel like but trusting that they were in the right place. 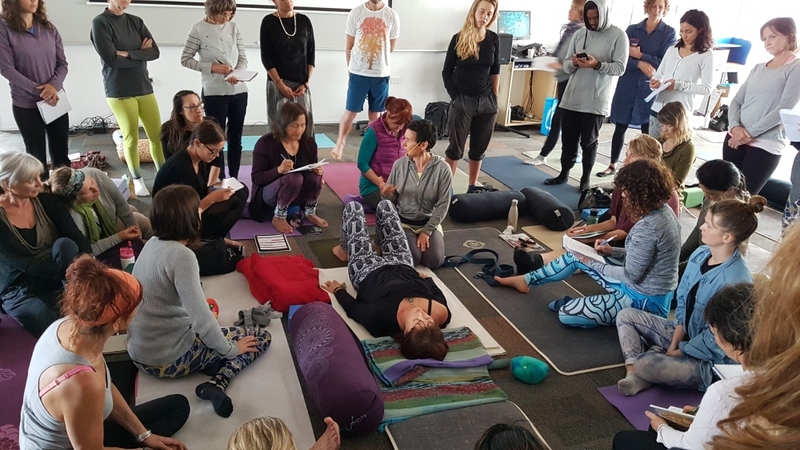 For me, as a yoga student who also works in the NZ yoga industry, it was so valuable to have a time and space where I could connect, learn and be in dialogue with the yoga community. By the third day, I could sense the building energy and excitement building for what Hauora 2019 could be. I imagine it will be much bigger, once the word gets out about how awesome 2018 was, but that there’ll still be that same sense of collective magic, deep learning and more opportunities for important conversations about yoga therapy, yoga teacher training and industry support. I can’t wait! Lucinda is the Editor of The Yoga Lunchbox. 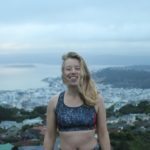 She has worked at The Yoga Lunchbox since 2012, and she loves the opportunity to be constantly immersed in the world of yoga, and particularly in the vibrant NZ yoga community. Lucinda is a constantly curious learner, particularly in the areas of movement, plants, nature connection and embodiment. She loves to hear from Yoga Lunchbox readers, so get in touch with her via email with your questions, ideas and stories.